Popular Nollywood actress Lizzy Anjorin has taken to social media on a quest to motivate her fans about finding success. The actress advised her fans to sit tight and be humble as they hustle to make money. The actress who shared her motivational message on Instagram, noted that the expensive items she uses are not luxury to her, but a reminder to double her hustle. According to her, she works hard to make sure that she keeps smiling. She stated that the spirit of hustle can make magic by putting a smiling on a person's face. Anjorin further went ahead to advise her fans, telling them that the only way ti leave poverty behind, is to mind their own business, keep hustling and be happy for people regardless of who they are. 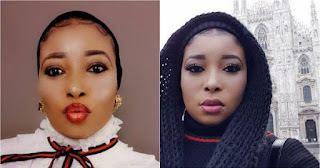 Actress Lizzy Anjorin shares motivational message on social media, talks about her hustle She wrote: "Flying to 6 to 7 countries with business class from your pocket just to buy wosi wosi, wearing a foot that can walk you into a destiny and you are rocking a sunshade that can see the future all from your pocket . You will sit tight and humble yourself. This sh1t are not luxuries to me but a reminder to double your hustle because every hustle behind this sh1t is deadlier than death. When you get to this level, people matter no go come your brain let alone your mouth. Yes, I left Nigeria few hours after my event . A lot of people were saying you suppose rest ..but hey ladies!! hustle don't kill the love of things we can't control kill faster than SNIPER. That is LOVE & MONEY.. but the spirit of your hustle can make magic happen by putting smile on your face. If you still want to be free from that poverty garment, you need to mind your business and be happy for people regardless of who they are ...abeg help me tell Arike lazy chicken ti ko se ya ni kobo that I missed her. Thank you all my family in italiano ��"